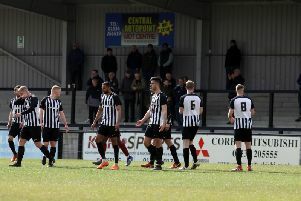 Jordon Crawford hit a hat-trick as Corby Town fought back from a goal down to claim a 4-1 victory at struggling Gresley FC in the Evo-Stik League South. The Steelmen handed a debut to midfielder Cameron Healey, who had joined on a one-month loan from Mansfield Town during the week, but they fell behind on 18 minutes when Reece Morris scored after good work from Jason Law. Corby levelled five minutes before half-time when Crawford slotted home after Jason Lee’s shot was deflected into his path and they took the lead four minutes into the second half when Connor Kennedy’s shot found the net. And Crawford wrapped up his hat-trick and the three points with two goals in a minute. First, he tapped home after Phil Trainer’s header had been saved and the young winger capped off a memorable day when he cut inside and curled home his shot. There was still time for Sam Wilson to make his mark as the young goalkeeper made a fine penalty save late on. The win was enough to send the Steelmen back into fifth place and into the play-off positions. AFC Rushden & Diamonds’ fine form continued as they moved up to second place in the Evo-Stik South League East after a 2-0 success at Ashford Town (Middx). Andy Peaks’ team did their damage in the first half as, after a cagey opening, they took the lead when Tom Lorraine held off a defender and beat the home goalkeeper at his near post. And that lead was doubled when Ryan Robbins drove into the box and produced a cool finish. Diamonds did have further chances with Lorraine being denied by the goalkeeper after going through while, after the break, Farrell and Lorraine both went close. With unbeaten leaders Moneyfields being held 1-1 at fellow high-fliers Cambridge City, the victory also saw Diamonds move to within three points of the table-toppers. Diamonds can now look forward to a big game with Cambridge at Hayden Road on Tuesday night.